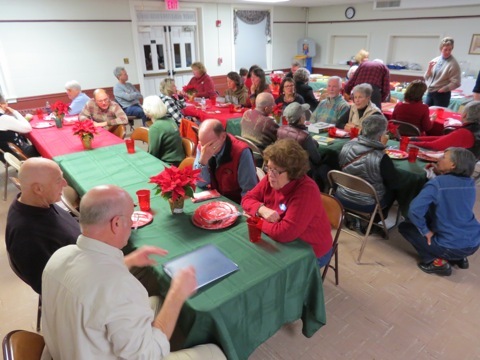 The Augusta Bird Club's first Christmas Bird Count was held on December 14th. Two 'owling' teams set forth in the wee hours of the morning. In addition to garnering a few owls (Barn, Screech and Great Horned), we were treated to an additional wonder of the night, the Geminid meteor shower. It was a beautiful stellar icing to the cake! With sunrise and beautiful clear, blue skies showing themselves, we knew it was too beautiful of a day for great birding!!! Where was some bad weather to bring in more birds!?!? What unfolded for the day gave us 75 species with some interesting sightings and a few records for the day including 3 Cackling Geese, a Merlin, four Barn Owls tied the 2011 and 1971 records, Common Merganser (6), Red-shouldered Hawk (14), American Kestrel (36) and Winter Wren (9). Many, many thanks to the members of the club who participated in the local 48th CBC. 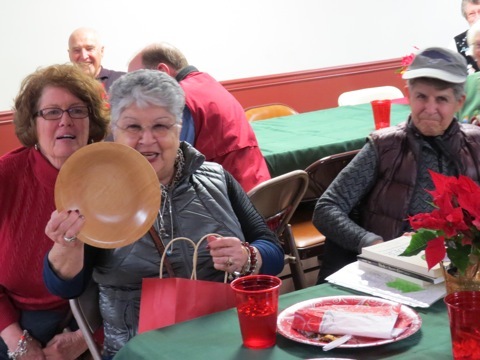 The club's 2014 holiday party on December 8th featured many pot luck dishes shared by members, as well as punch and door prizes. Many thanks to Linda Matkins for organizing the extensive preparations. Festive members feasting at the holiday party. Among the many door prizes that were given out, Jo King won a wooden bowl hand-carved by Starke Smith, a club member. The 2014 Rockfish Gap Hawk Watch, our 39th season, was quite an action-packed season with many new records! We finished the season with a record-setting 16 different raptor species (not including vultures), with all species above their 10-year season average and most well-above average. In fact, we had new season records for 11 different species! In total, 24,313 migrating raptors were counted, which is well above our season average of 16,223. Our season spans August 15 to November 30, and we were able to have excellent coverage this year (696.25 total hours). The last time we had over 600 hours of coverage was in 1994. We started the season with a 1-2 punch of two Mississippi Kites on August 15 and 16, followed by a third Mississippi Kite on October 4, breaking the previous season record of one in 8 separate years! Not to be outdone, we had two Rough-legged Hawks (November 16 and 20) where only single sightings occurred in five different prior seasons. Finally, the icing on the cake was a migrant Swainson's Hawk on October 4 where a total of only 3 prior sightings are on record. A second, non-migrant Swainson's Hawk was also observed on August 27. We have never had a prior season with all three of these rare raptor species! In addition to raptors, we also try to keep track of other avian migrants at Rockfish Gap Hawk Watch, and this year we ended with a total of 125 different species including raptors. Among the highlights were a total of 431 Ruby-throated Hummingbirds, including a new single-day record of 168 on September 2. (The previous single-day record was 71.) The warblers put on a good show this fall with 21 species recorded. 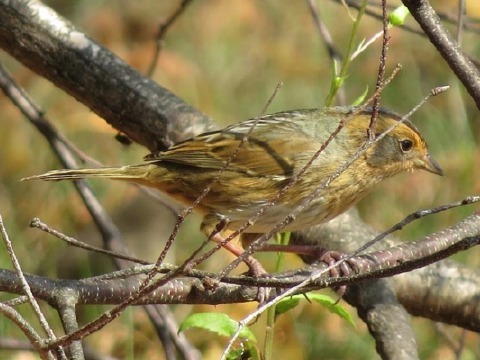 The sparrows also made a great showing with 13 species, including a rare Nelson's Sparrow on October 2. A few uncommon migrants include: Brewer's Blackbird, Olive-sided Flycatcher, Northern Pintail, Great Egret, Rusty Blackbird, Tundra Swan and American Pipit. The Monarch Butterfly has made a remarkable recovery this year (1,589 counted total) after an abysmal count of only 194 last year! Our highest single-day count was 242 on October 5. We had our 3rd annual Open House on September 14 called "Where the Raptors Soar! A Day at the Hawk Watch." It was very successful with over 111 visitors. We had plenty of food and drinks as well as displays of various educational materials about raptor conservation and migration. The Wildlife Center of Virginia also gave a raptor presentation at 1pm with several live raptors to show! We would like to recognize and thank all the counters and observers who contributed to a successful season including: Brenda Tekin, Vic Laubach, Rose Thomas, Gabriel Mapel, David Hunter, Allen Larner, William Leigh, Pete Nebel and Josh Laubach. We'd also like to thank Mary and Daniel Mapel who have supported the hawk watch in so many ways. If interested, various photos from our 2014 season can be found at smugmug.com. See you next fall, and keep looking up! NOTE: The above text is a condensed version of the full report submitted by Vic Laubach and Brenda Tekin, Coordinators of the Rockfish Gap Hawk Watch. The Augusta Bird Club's 2014 bird seed sale was a big success, helping us reach our fundraising goals for this year. 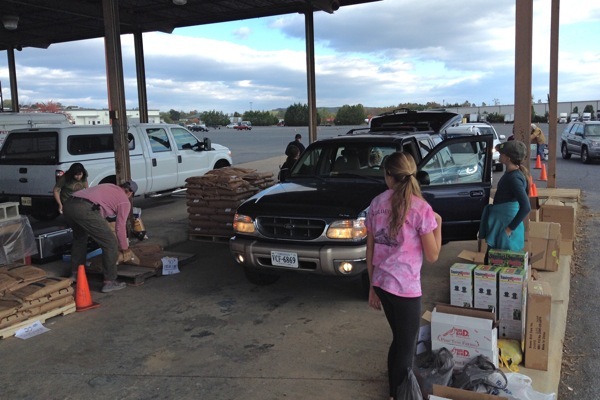 The pick-up day was on Saturday, October 18, and we had plenty of helpers, including several young folks who participated in Nature Camp, which our club is proud to support. Many thanks to Crista Cabe and the other members of the Seed Sale Committee: Grant Simmons, Gabriel Mapel, Mary Mapel, Lisa Hamilton, and Linda Matkins. The bird seed sale pickup behind the Augusta County Government Center in Verona. 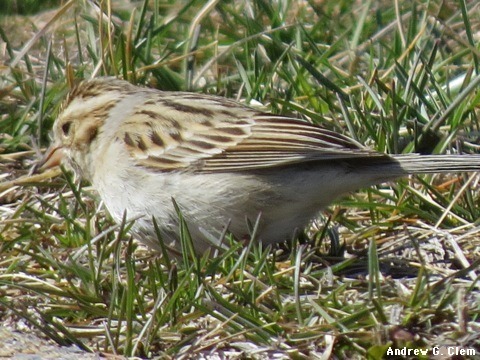 Gabriel Mapel spotted a rare Nelson's Sparrow near the Inn at Afton in early October, and Ann Cline took a photo of it. Ever since the 2014 season at Rockfish Gap Hawk Watch got underway on August 15. Brenda Tekin, Vic Laubach, Gabriel Mapel, and Rose are among the regular observers, often assisted by others, and joined by visitors from all around the area on most days. During the third week in September, over 1,000 Broad-winged Hawks were seen every day, but those numbers have begun to decline. Besides the numerous hawks, eagles, and falcons passing overhead, the crew keeps tabs on various songbirds and Monarch butterflies migrating through as well. On Sunday, September 14, a special event called "Where the Raptors Soar! A Day at the Hawk Watch" was held, replacing the previous open house. It was very successful with a big turnout of visitors, at least 111, including many younger folks learning about raptors and migration, learning about what we do, how we do it, and why. The by the Wildlife Center of Virginia gave a raptor presentation, including some live raptors! Free refreshments were provided, and educational materials and mounted raptor specimens were on display. Thanks to all those who worked to set up this big event, which does so much to raise public awareness. The Rockfish Gap Hawk Watch is held on the grounds of the Inn at Afton, located right off I-64 (exit 99) at the intersections of Rt 250, Skyline Drive and the Blue Ridge Parkway. For more information, see www.rockfishgaphawkwatch.org. 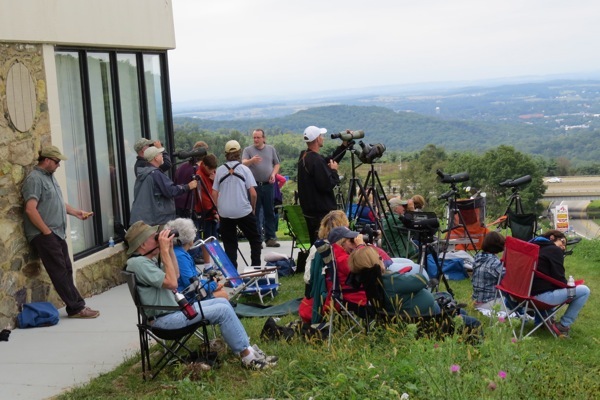 A large contingent of visitors came to the Hawk Watch open house on September 14. Additional photos from the event taken by Vic Laubach can be seen at: smugmug.com. The team of Allen Larner, Ed & Nancy Lawler (known collectively as "Augusta Old Coots Gone Wild") did the Special Venue at Chincoteague for this year's Kiptopeake Challenge. We spent 14 hours in the field in and around Chincoteague. Our total species topped 96 for the day. On the refuge at the woodland trail in the parking lot we had a Barn Owl calling. At the causeway there were over 350 White Ibises. We saw five species of Terns on the same sandbar at Toms Cove, and ten Warbler species altogether, along with American Wigeon, Black Scoter, Northern Pintail, and all of the Herons and Egrets. As for Shorebirds, we saw Dunlin, Short-billed Dowitcher, Willet, and Marbled Godwit. Finally, we saw all three species of Falcons, and a Northern Harrier. The Cornell Lab of Ornithology has begun a "BirdCast" service, helping birders keep up with the latest movements in bird migration. See birdcast.info. 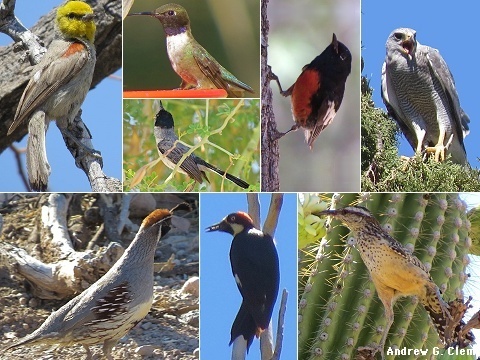 Clockwise from top left: Verdin, Black-chinned Hummingbird, Painted Redstart, Gray Hawk, Cactus Wren, Acorn Woodpecker, Gambel's Quail, and in the center, Black-tailed Gnatcatcher. 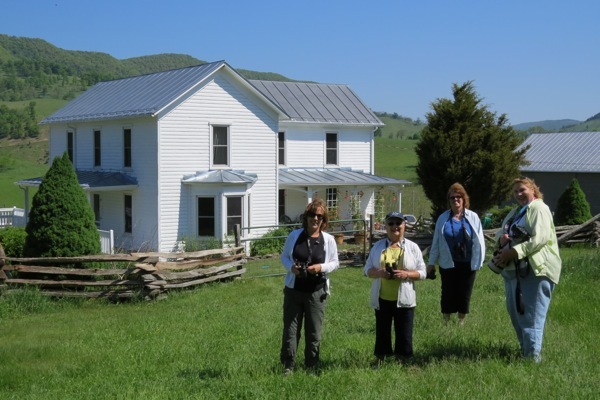 On Sunday, June 1, Allen Larner led nine birders on a very successful field trip for the Augusta Bird Club to Highland County, and 84 species were tallied for the day within Highland County. We were able to find all of our target birds except Black-billed Cuckoo. Our successful target birds included Alder Flycatcher at the Beaver Ponds at Straight Fork, Golden-winged Warbler at Margaret O'Bryan's property on the West Virginia line, two Mourning Warblers on the Allegheny Road shrubby area about 1 mile from Laurel Fork Road, Canada Warbler along Laurel Fork Road, Vesper Sparrow on Heavner Lane, and Bobolinks throughout the Blue Grass Valley. 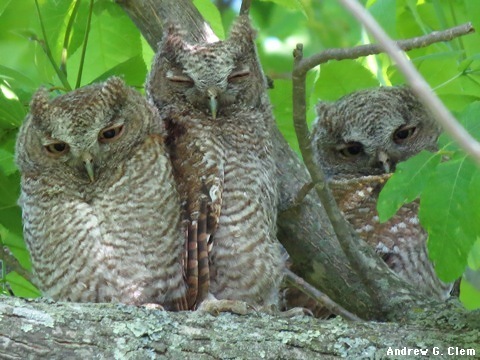 At the top of the list of unexpected finds was a family of five Eastern Screech-Owls (red and gray morph parents, and 3 fledglings) shown to us by John Spahr, near the corner of Hardscrabble Road and Heavner Lane. Three Screech Owlets; the two parents were perched nearby. Golden-winged Warbler, at the O'Bryans' house. Photo courtesy of Ann Cline. Ann Cline, Jo King, Elaine Carwile, and Brenda Tekin at the O'Bryans' house. Stopping to look for warblers, thrushes, and tanagers on Laurel Fork Road, deep in a remote mountain forest. 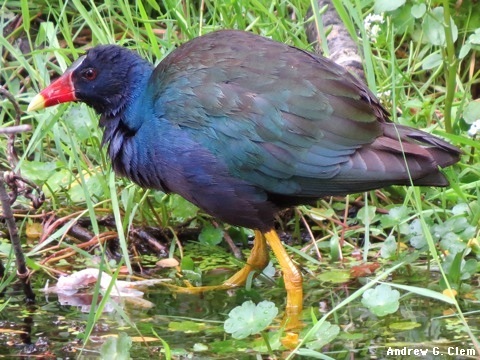 Purple Gallinule, at Loth Springs in Waynesboro, May 29. Many birds, and many field trips! The 2014 spring migration season has come and gone, and members of the Augusta Bird Club have many happy memories of it. 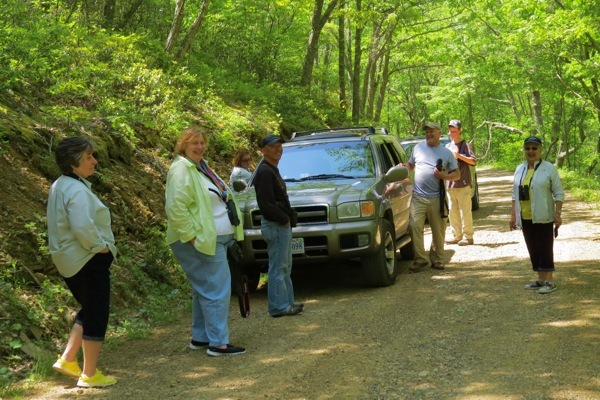 On Wednesday May 21, Jo King led a field trip to McCormick's Mill with seven members of the Augusta Bird Club, of which two were new birders. A total of 41 species were seen or heard at the Mill, including both oriole species, a Solitary Sandpiper, an Eastern Wood Pewee, and a Yellow-billed Cuckoo which arrived just as the group was leaving. A Warbling Vireo nest and an Orchard Oriole nest were located as well. At the conclusion of the trip, several members continued on to Willow Lake in Rockbridge County, where a Yellow Warbler, a Greater Yellowlegs, both heron species, and two Bald Eagles were seen. 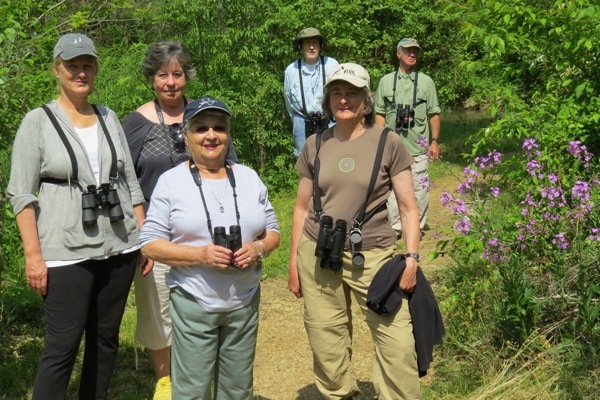 Happy birders on the Marl Creek Trail at McCormick's Mill, May 21. 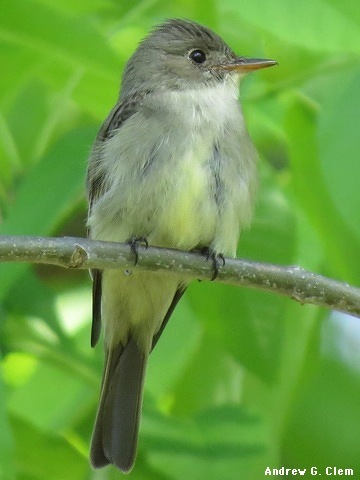 Eastern Wood Pewee, at McCormick's Mill, May 21. 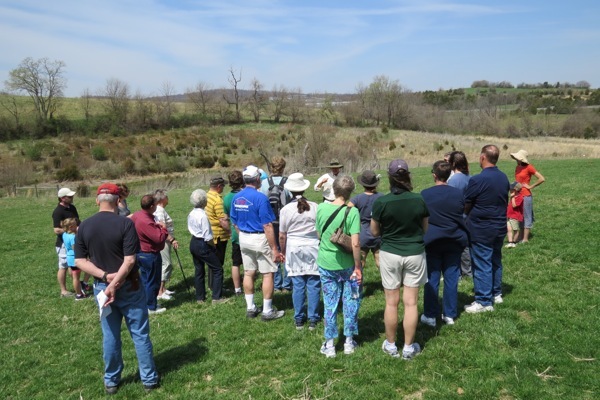 On Monday May 5, Gabriel Mapel led a group of six birders who explored the Riprap Trail. The stream was high, however, so they couldn't continue on past the stream crossing. A variety of flycatchers, warblers, and other songbirds were identified, including a Rose-breasted Grosbeak. On Sunday May 4, the Augusta Bird Club held its annual May picnic gathering, at Natural Chimneys for the first time. Penny Warren coordinated the field trip, but strong winds made hearing birds very difficult. 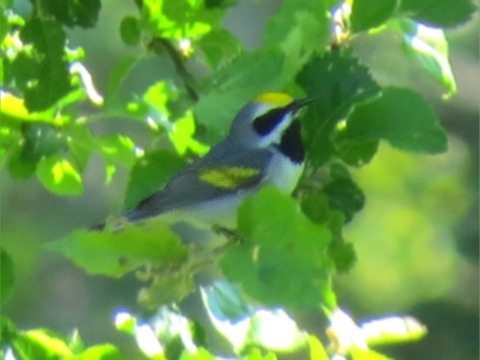 Highlights included White-eyed Vireo, Yellow-throated Vireo, Nashville Warbler, Chestnut-sided Warbler, Black-throated Green Warbler, Scarlet Tanager, and Indigo Bunting. On Saturday May 3, "Team Fly Like An Eagle!" (Brenda Tekin, Gabriel Mapel and Vic Laubach) spent the entire day birding in Highland County as part of the annual "Raptorthon" tally. They identified 101 species altogether, including 11 raptor species! Special highlights were all 3 accipiters including an adult Northern Goshawk, all 7 woodpecker species, 3 wrens, 5 thrushes, 1 owl and 18 warbler species. 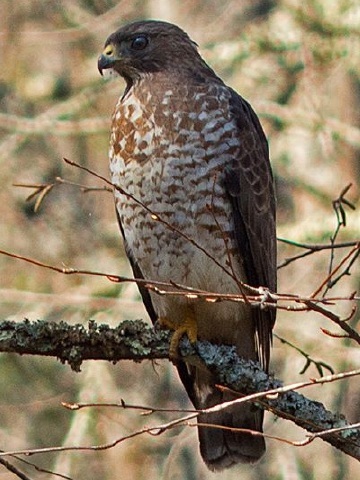 Broad-winged Hawk, courtesy of Vic Laubach. On Tuesday April 29, Gabriel Mapel and Dan Perkuchin braved the wet weather on a field trip to Grand Caverns Park in Grottoes, and found a wide variety of warblers and shorebirds. Later that day, Gabriel successfully spotted a rare Sora that had been reported at Shenandoah wetlands. Sunday, April 27 was "Big Spring Day," coordinated as usual by Allen Larner. Those participating in Augusta County logged a total of 635 miles in car, 10 miles by foot, with about 60 + hours in the field. The total number of species for the day was 141, which is the second highest count ever. A total of 20 Warblers species were seen or heard, and a Ring-billed Gull and Forester's Tern were also seen. Other highlights included a Snow Goose (very late), a Virginia Rail that was found in a yard at the base of Shenandoah Mountain, a Sora, some Eurasian Collared Doves in Mount Solon, a Swainson's Warbler, and 72 Great Blue Herons. On Saturday April 26, Andrew Clem led a trip to Chimney Hollow, a wooded trail in western Augusta County. Conditions were wet and muddy, but several very nice birds were observed at close range, most notably a Northern Parula. Other highlights included Blue-gray Gnatcatchers, Blue-headed Vireos, a Broad-winged Hawk, and a Pileated Woodpecker. Afterwards, the trio went to nearby Braley's Pond and saw Spotted Sandpipers, a Blackburnian Warbler, and a Red-breasted Nuthatch, among others. 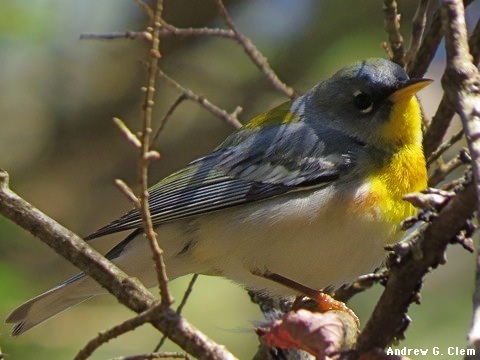 Northern Parula, at Chimney Hollow, April 26. 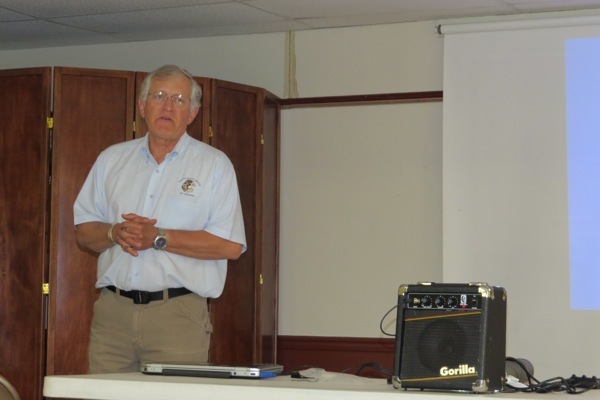 At the April meeting of the Augusta Bird Club, Ed Clark, president of the Wildlife Center of Virginia, spoke to members about all the rescue and healing activities carried out by his staff in recent months. There has been a surge of orphaned Black Bear cubs, two of whom were unfortunately "spoiled" by human contact and will probably never return to the wild. He described the big new enclosed area in which the bears get used to climbing trees and foraging for food, and explained how the veterinarians and volunteers at the Center take care of so many patients. It was a privilege to hear first-hand about all the great being done by this wonderful institution. For more information, see wildlifecenter.org. Ed Clark, speaking to the Augusta Bird Club at the April 14 meeting. Saturday, April 12 was Earth Day, and the Augusta Bird Club had an informational table set up in the Sunspots Parking Lot, from 9 a.m. until noon. Once again, Catherine Kohus was helping children to make pine cone bird seed feeders and providing information about club activities. 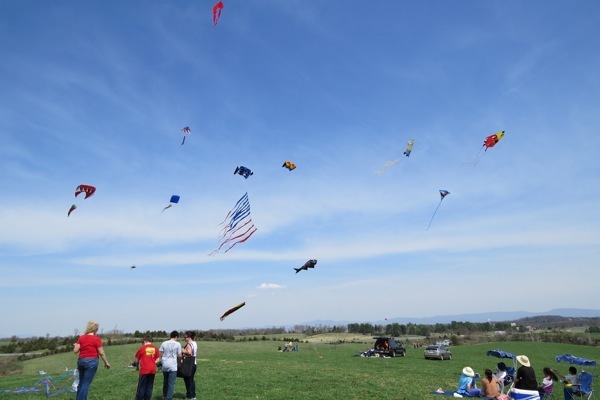 On Sunday, April 13 there was a special "Kites and Critters" event at Ford Farm on Bell's Lane, from 1:00 - 5 p.m. It featured family-oriented exhibits and hands-on activities relating to conservation and farm practices. JMU instructor Robert Whitescarver was among those who led tours of the Ford-Moore farm, explaining about how some types of grasses (such as fescue) are harmful to native wildlife. For more information, see the Valley Conservation Council Web site: www.valleyconservation.org.. Dozens of kites on a perfect windy day at the Ford-Moore farm, April 13. Tour led by Robert Whitescarver at the Ford-Moore farm, April 13. As the long, harsh winter came to end at last, we experienced some very nice side-effects of the extreme weather in terms of migratory birds that aren't often seen in the Shenandoah Valley. 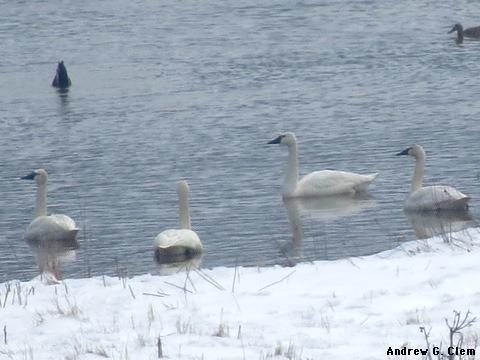 In addition to those pictured below, there have been reports of a Snow Goose, a Ross's Goose, several Eared Grebes, and even a Purple Gallinule that was taken to the Virginia Wildlife Center after being attacked by a cat in Waynesboro. (See wildlifecenter.org.) It is the first bird of that species ever recorded in Augusta County, and we all hope it fully recovers! 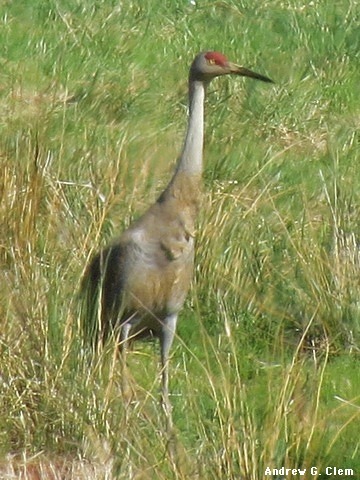 Sandhill Crane, north of Fishersville, April 16. Three Sandhill Cranes were seen west of Harrisonburg in March. Clay-colored Sparrow, near the Day's Inn on Bell's Lane, on March 26. At the February 10 meeting of the Augusta Bird Club, Kevin Shank, the editor of Nature Friend magazine (www.naturefriendmagazine.org), discussed the special techniques he has developed over the years for photographing birds in flight. His particular interest is owls, and he showed many photos, most notably a Screech Owl repeatedly going after a mouse that was used as "bait." He explained how he got involved in the endeavor of bird photography, and how he and his family came to the magazine publishing business. At the end of the meeting, he shared copies Nature Friends with club members, and made available for sale books full of spectacular bird photographs. 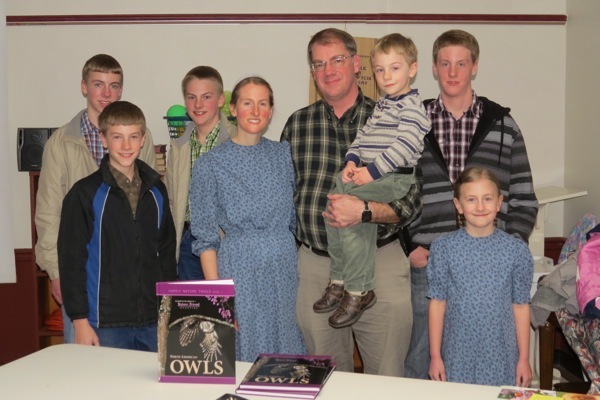 Kevin Shank and his family, with the owl books on sale after the meeting. 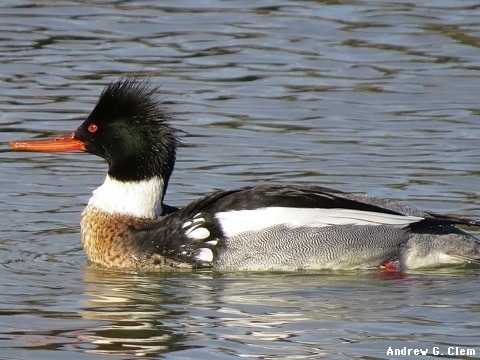 The Snowy Owls seem to have left our area, but there are continuing reports of Red-necked Grebes and numerous uncommon ducks. White-winged Scoters linger in various local ponds, and Red-breasted Mergansers and Common Mergansers (which are not at all common in these parts) have been seen multiple times on Lake Shenandoah, east of Harrisonburg. 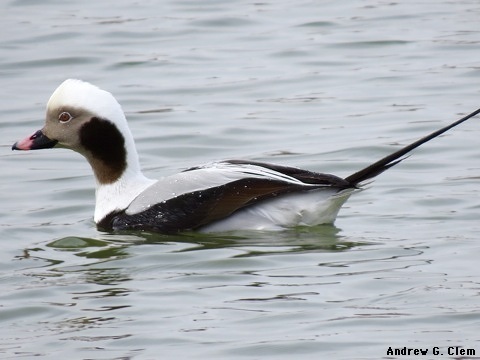 In addition, a male Long-tailed Duck was seen on Willow Lake, south of Raphine. Long-tailed Duck (male), on Wilow Lake, on February 10. Red-breasted Merganser (male), on Lake Shenandoah, on February 23. Saturday, February 8, "Introductory Bird Walk" at 9 AM at the Frontier Culture Museum parking lot. Wednesday, February 12, "Introduction to Back-yard Bird Feeding and Bird Identification" at 7 PM at the Staunton Public Library meeting room. 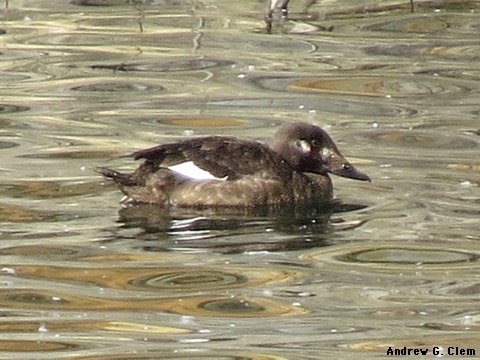 UPDATE: Even more unusual winter visitors showed up in late January: some White-winged Scoters, which were seen at various ponds in Augusta County. In addition, two males were found "stranded" on land (they can only take off from water) and had to be taken to the Wildlife Center of Virginia for treatment. According to Birds of Augusta County (2008), edited by YuLee Larner, the last time this species was seen in our area was November 1986. Very rare indeed! 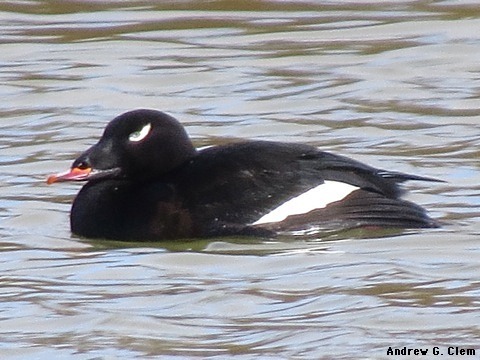 White-winged Scoter (male), in Waynesboro, on February 5. White-winged Scoter (probable female), south of Fishersville, on January 31. As the winter solstice passes, there are more and more reports of seldom-scene birds in the Augusta County area. First and foremost are the Snowy Owls that have been seen in various locations in the Shenandoah Valley since late November. It appears to be a major "irruption" of this northern species into the Lower 48 states. In addition, there have been multiple sightings of Lapland Longspurs, Northern Harriers, and Greater White-fronted Geese. UPDATE: In early January, two Snowy Owls were spotted within a mile of each other east of Bridgewater along Route 11, and south of Harrisonburg on Cecil Wampler Road. 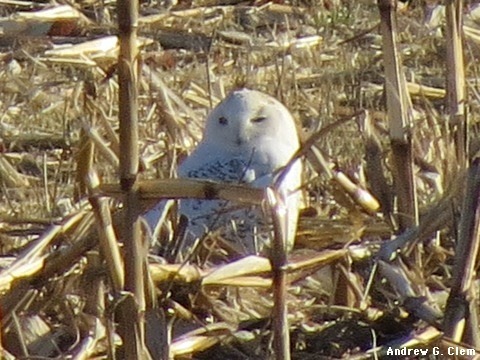 Snowy Owl, south of Harrisonburg, on January 12.